Exciting and exotic, our protea posy is another example of fabulous flowers from South Africa. Prized for its brilliantly coloured bracts and flowers, the protea is also famed for its variety of forms. Indeed, it takes its name from Proteus, the Greek sea god who could change his shape at will. Beautifully crafted for absolute authenticity, the protea in our posy captures all the vitality and vibrancy of the original. Delicate and pretty, this stem of Fleurwood’s Natural Latex Protea Flower is detailed and beautifully realistic. It adds a wonderful touch of glamour. The real beauty of natural foam flowers is that they last forever; season to season in perfect bloom with no watering, pruning or wilting. At Giftlab we are passionate about imitating nature with absolute precision, and that's why we study real flowers and plants as a reference for each design. The results are blooms so lifelike that even the bees are fooled! 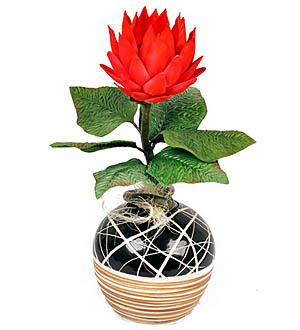 Each Protea Flower Stem measures 63cm in length and the flower 12cm in diameter.